I’ve been nominated as the best personal blog of Vancouver in the Best of 604 competition. Started by Rebecca Bollwitt, the Best of 604 aims to find the best sites and blogs from Vancouver. In reality, it’s just a popularity contest because the only requirement to win is to get the most votes. So head over there and vote for me! If I win the best personal blog category, I’ll give away a $397 copy of Traffic Secrets 2.0 by John Reese. Traffic Secrets 2.0 is a HUGE 12 CD-ROM course that will teach you exactly how to get massive amounts of traffic to your blog. I thought the 300 page Web Site Maximizer kit from SitePoint was huge until I found out the Traffic Secrets manual is 387 pages long! How big is Traffic Secrets 2.0? Take a look. 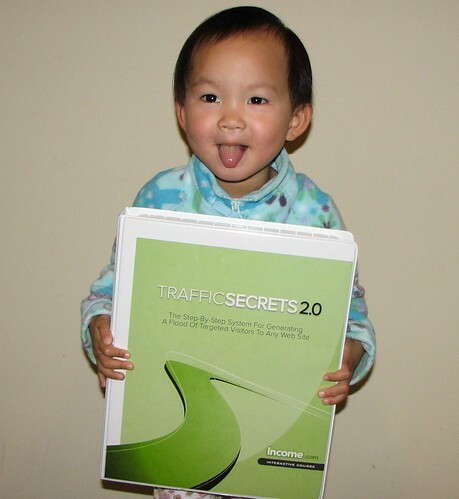 As you can see, Traffic Secrets 2.0 is almost as big as Sally. It’s actually worth the $397 that John Reese ask but you can win it by helping me win the Best of 604 contest! All you have to do is head over to Best of 604 and vote for me and tell all your friends to vote for me. Leave a comment on this post after you voted. I am going up against a lot of strong blogs and really need your help if I’m to win this thing. Voting is open until December 10. Winner will be announced on December 11.